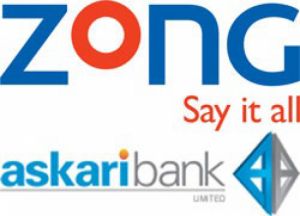 Zong got issued license from State Bank of Pakistan to start branchless banking in collaboration with Askari Bank. Zong will provide different branchless banking services like mobile account, money transfers and utility bill payments etc. Earlier in September 2012 Zong and Askari Bank went under SBP audit and now SBP has issued the license this Friday to start branchless banking that will likely start at the end of November 2012. It is the first time in Pakistan that a Telecom Company has collaboration with a commercial bank where non of the parties have controlling interest or shares to provide branchless banking to people of Pakistan. Earlier the same week, SBP approves Waseel Bank of Mobilink to start branchless banking to fulfill mobile financial services.